According to today’s Wall Street Journal, “The Central Intelligence Agency has begun moving weapons to Jordan from a network of secret warehouses and plans to start arming small groups of vetted Syrian rebels within a month, expanding U.S. support of moderate forces battling President Bashar al-Assad, according to diplomats and U.S. officials briefed on the plans. “The shipments, related training and a parallel push to mobilize arms deliveries from European and Arab allies are being timed to allow a concerted push by the rebels starting by early August, the diplomats and officials said, revealing details of a new covert plan authorized by President Barack Obama and disclosed earlier this month. “The CIA is expected to spend up to three weeks bringing light arms and possibly antitank missiles to Jordan. The agency plans to spend roughly two weeks more vetting an initial group of fighters and making sure they know how to use the weapons that they are given, clearing the way for the first U.S.-armed rebels to enter the fight, diplomats briefed on the CIA's plans said. 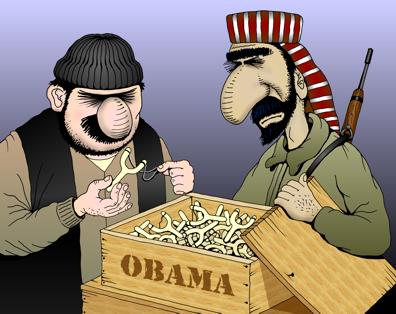 “Talks are under way with other countries, including France, about pre-positioning European-procured weapons in Jordan. Saudi Arabia is expected to provide shoulder-fired antiaircraft missiles, known as MANPADs, to a small number of handpicked fighters, as few as 20 at first, officials and diplomats said. The U.S. would monitor this effort, too, to try to reduce the risk that the MANPADs could fall into the hands of Islamists. “Up to a few hundred of the fighters will enter Syria under the program each month, starting in August, according to diplomats briefed on CIA plans. At the dawn of the revolution, Syria-watchers expected the regime to propose a live-and-let-live compromise to weather the storm, if not to take the wind out of the sails of protesters. The Syria-watchers were citing previous instances when the regime caved in and agreed terms set by previous adversaries such as Israel, Turkey’s military and Washington. The regime will now do the same to live on and avoid a losing war against its people, they were saying. The Syria-watchers were proven wrong when the regime refused to cede an inch to its opponents and chose to engage them in a do-or-die struggle. A year-and-a-half later, some people thought Iran, which was backing the regime and milking Iraq to fund it, would use her pragmatism and realism to check Damascus’ recklessness, having failed to use backroom talks on her nuclear program to save it. She did not. Iran chose not to build on Russia’s and some Western states’ amenability to Assad to thrash out a reasonable denouement to the crisis. Iran’s fervor to “ignite the region” and stoke the fires of sectarianism now surpass the regime’s zeal. She had no qualms about turning Hezbollah forces into guns-for-hire and contract killers in Syria and Lebanon. Until the past few weeks, there were also people who thought change would turn up in Moscow. Russia is a Big Power carrying the responsibility to protect (R2P). She is aware that her and the others’ talk of external “interventions” is sheer manipulation of the crisis. Proof is that at no one stage did the regime truly and directly risk being overthrown. Moreover, in their uninterrupted contacts, the Americans let the Russians know that the West did not intend to intervene in Syria and that a political solution was and remains the immutable goal of the Obama Administration. The Russians refuse to play ball. It serves them well to let the crisis drag on and to persevere in rubbing the West’s nose so long as the regime holds out. By insisting to manage the crisis, Russia finds herself adopting the policies of a rogue state with a mindset cloned from Iran and Syria. All this to say that waiting for a political solution anytime soon is like waiting for Godot -- it is simply not on the regime or its two principal partners’ mind. G7 leaders must have felt this from their Russian partner at the G7+1 summit in Northern Ireland. They must have realized their Russian partner wants to use them as tools to continue the Syria war. He is their partner in the war on the “terrorists” he uses against them. He is the G7’s partner in figuring an end to the crisis. But he is also the partner of the Syrian and Iranian regimes in distancing that end pending their victory on the battleground. He is the G7’s partner in the search for stability in the region. But he is also the partner of the Syrian and Iranian regimes in plans to overwhelm the G7’s Arab allies. He is their partner in forestalling sectarian conflicts in and around Syria. But he is also the partner of the Syrian and Iranian regimes in stoking the fires of religious wars. G7 leaders were made aware their Russian partner is not interested in Geneva-2 unless it upholds the regime in one way or another. Washington’s decision to arm Syrian opposition forces and to re-balance their fight with the regime and bring about a diplomatic solution when none is in sight is like a blind man in a dark room looking for a black cat that isn’t there. Labels: Assad, CIA, G8, Hezbollah, Iran, Jordan, Obama, Russia, Saudi Arabia, Syria, Syrian rebels, U.S.